The Boscobel Central House Hotel where it all began. Ever wonder just when and where the idea of the ministry of The Gideons International began? It was on September 14, 1898, that two Christian businessmen met in a little hotel lobby in Boscobel, Wisconsin and began a friendship that resulted in a ministry that would spread God’s Word throughout the world. Traveling salesmen, John H. Nicholson and Samuel E. Hill, had both arrived at Boscobel’s Central House Hotel. 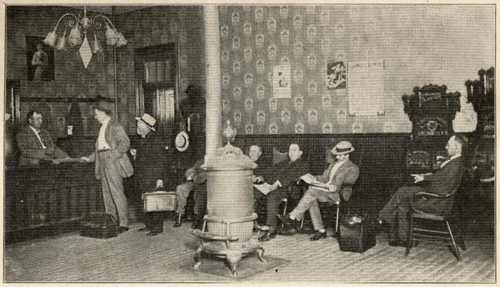 A convention that was occurring at the same time, created a shortage of rooms. Nicholson, who was well known to the hotel desk clerk, arrived at the hotel at about 9 pm. The clerk told him there was only one bed left in the hotel, and that it was in Room 19, which had two beds. One of the beds had already been assigned to Mr. Hill. The clerk pointed out Mr. Hill, who was sitting in the lobby writing up his sales orders. The lobby of the Boscobel Central House Hotel, where John Nicholson and Sam Hill first met. Mr. Nicholson, a Christian, was relieved to see that Mr. Hill was a clean-looking man, which was in contrast to the drunk lying in the floor and another one lying in the corner. Two poker games were in progress. The air was thick with tobacco smoke and the noise from the crowd in the bar was spilling over into the lobby. Mr. Hill agreed to allow Mr. Nicholson to spend the night in the same room. Mr. Nicholson proceeded to the room to begin writing up sales orders while Mr. Hill remained in the lobby. Inside the room, Nicholson worked on his sales correspondence. Some time later, Mr. Hill entered the room and quickly fell asleep in his bed. When Nicholson finished working, he reached over and picked up his personal Bible and began to read. At that point, Mr. Hill awoke. Twenty years earlier, at his dying mother’s request, Nicholson promised her that he would read his Bible and pray daily. He had been a Christian since the age of 13. Nicholson read from the 15th chapter of John, verses 1-16. The two men prayed together and then talked until 2 am. It was during this conversation that the idea was born to establish an association of Christian traveling men. 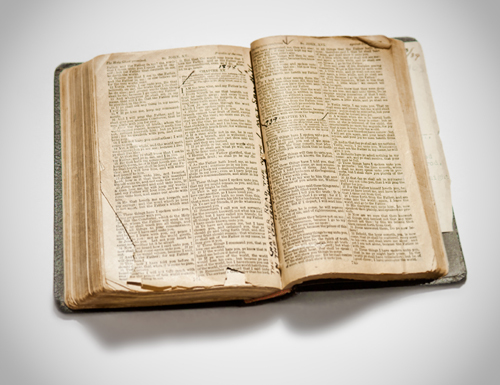 The very Bible that John Nicholson read from that September evening back in 1898. Today it is on permanent display at the headquarters of The Gideons International. Future meetings between Nicholson and Hill, as well William Knights, would take place over the next few years. These meetings resulted in the formal organization of what would become The Gideons International. 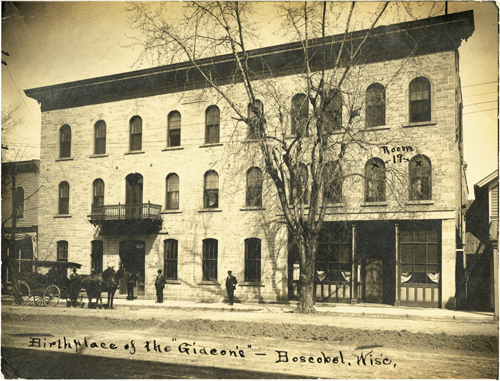 Today, the historic hotel in Boscobel where the two founders of The Gideons International first met is listed on the National Historical Register. Meet the great-granddaughter of John Nicholson, see the video here. Thank you for this material. I will share it with as many people as I can. What a marvelous reality of God´s amazing grace. Amazing and marvelous indeed how the Almighty God works to accomplish His plan and purpose for mankind! Glory to God! I am a Gideon from Beirut Camp-Lebanon, and I like the material, maybe I´ll share it with others. Truly God’s Plan will Prevail!! !